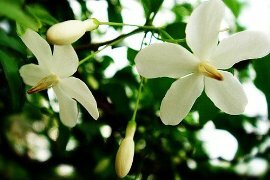 JASMINE: A jasmine plant is a great addition to a garden or a home. Jasmine, known for its beautiful flowers and shining leaves, can fill your house with a unique fragrance. Jasmine is basically a bushy shrub that releases fragrance at night. There are 200 species, mostly from Asia, Europe and Africa. Jasmine is native to tropical and warm temperate regions. This is one of the most beautiful, exciting and useful plants among fragrant tropicals. A very fragrant, enchanting shrub, flowers are fruity scented, pendant, are born along its twiggy branches. Foliage is thin and slightly hairy, it can flower almost all year, easy to prune for shape and size. It is widely planted near and around temples and homes for its stunning fragrance. Prefers well draining soil, partial to full sun. A truly remarkable site! It has always been a popular ornamental tree in temples and houses. In Thailand, it is probably the most popular plant, you can see it everywhere along the streets planted in ground as a specimen, a hedge or potted, it belongs to every garden! This plant is sacred among Buddists. Fruits are paired pods, 9" long. Wrightia is easy to maintain and requires minimum supervision but needs constant watering only. Wrightia is cold sensitive and becomes deciduous under 65F. In warm subtropical and tropical climates it stays evergreen and blooms year round. Because of its fast growth rate Wrightia can be trained into a bonsai tree within a short period of time. It can be easily trained and wired into odd and weird shapes. Traditionally used as medicinal herb. Roots are used to cure skin disease. It also makes an excellent house plant.